Have you ever imagined a life filled with prosperity and happiness? A life filled with happiness, family, friends and love. But then life happened, and dreams dramatically changed. Have you ever been held captive by the opinions of others, the fear of failure and a hostage to the titles of other? Are you living a life trying to satisfy the needs of others before one’s self, only to be entrapped by hurt, brokenness and loneliness? Has life, circumstances or situation caused you to forsake the one person you need most, one’s self? This story is for you. This story takes readers down a riveting road of pursing purpose. Vantashia’s story is so honest and real that it captivates audiences inviting them along for the ride of pursing their destiny. Whatever the situation or season a person may be in – difficulty finding purpose, fear of following passion, complacent in life, fear of failure or ridicule, controlled by the opinions, and thoughts of others or loneliness, this book is for you. 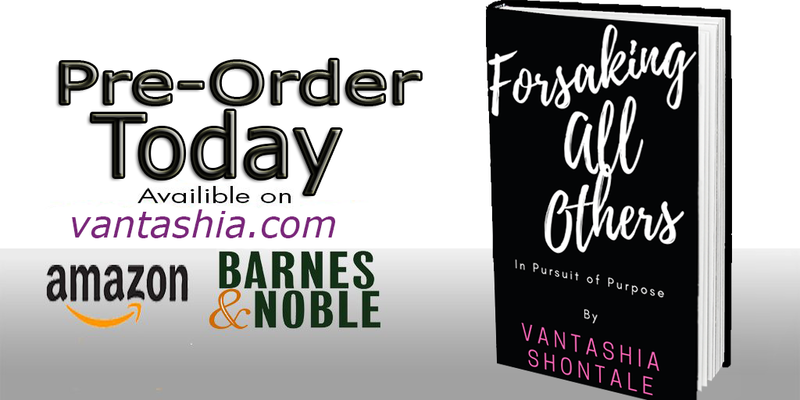 Vantashia shows readers, at some point, it can be a necessity to forsake all others in the pursuit of finding your destiny.